We hope you all had a great finish to 2013 and are enjoying the New Year! We are enjoying it with several new projects but wanted to share some completed ones with you as well. Today we're showing a kitchen that was transformed from the 1970's to a bright, vibrant space of today. We don't have professional photos done yet (still need to touch up paint on moldings and scrape the ceiling), but we couldn't wait any longer to show you the transformation. New finishes and cabinets were just what this space needed. The cabinetry was redesigned with taller builds, wider drawers and a revised layout to offer up a more efficient storage. 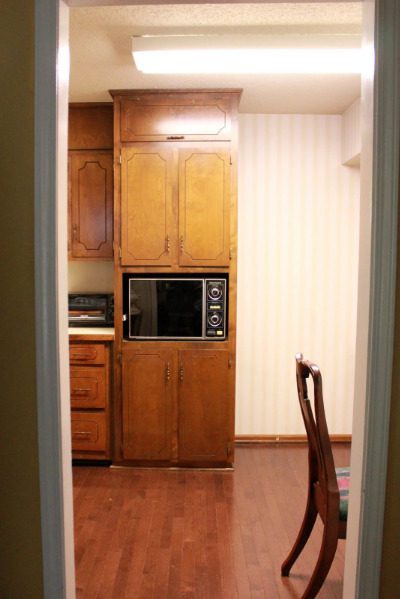 A custom pantry was built in the formerly wasted space to the right of the old microwave. The new microwave was relocated above the stove, and the area that used to house the microwave became an appliance garage, clearling off more room on the limited counter space. A pullout trash can was also incorporated into the new cabinetry. Can you spot where? We opted for white cabinets and subway tile backsplash to make this galley feel much wider with the same square footage, and the added crown molding gives the room new height. A gray quartz countertop offers a little contrast without breaking up the flow. The former florescent lights were replaced with schoolhouse pendants to work with the other traditional elements of the home and a new pendant was hung over the sink. Stainless steel appliances, undermount sink and faucet finished off the space. We love the transformation and so does the homeowner. Here's one more side-by-side comparison. Quite a change and another successful makeover!